Almost 40 percent of the U.S. population suffers from some form of depression or mental illness yet the causes of mental illness remain largely a mystery. The prevailing theory sees the cause as a trans-generational genetic defect of brain chemistry, which is best treated with medication. New breakthroughs made by health professionals dislodge this theory, and show that frequently previous traumas are what lead to mental illness. In this bold new book, renowned physician and psychotherapist Charles Whitfield takes a new look at the common problems of depression, anxiety, addictions, eating disorders, schizophrenia and other mental illness. The Truth About Depression shows the strong and at times causal relationship between childhood trauma and future depression and other mental illness; he explores the risks, side-effects and high cost of treating these disorders with anti-depressant drugs, and; provides an alternative treatment and recovery program for people with depression and a history of childhood trauma. Dr. Whitfield's book offers hope and help for those who have been held hostage by depression, and provides clinicians with new solutions and alternatives to high-risk medications. Throughout history we have looked for the cause of depression and other mental illness, and we still donÆt know it. The two major theories have long been and remain: nature (genes, biology) versus nurture (environment, family). In 1999 I began writing notes for my own use that summarized what I understood about depression and other so-called mental disorders based on what I had observed in my private practice and what I was reading in the clinical scientific literature. After I wrote half of it as these ônotes to myself,ö I realized that this information was too important not to share it. Sixteen years ago I wrote Healing the Child Within in a similar vein. I wrote it as educational material for my private patients, and not for public distribution. Eventually it was published by Health Communications and has sold about 1.5 million copies. Its usefulness was spread mostly by word of mouth from readers. Since then the principles I described there have not changed. They are still valid. But the literature to back it up has expanded to such an extent that I believe that it is now worth sharing with you. Its main problem is that this valuable and validating literature is scattered over numerous journals and books, many of them unknown to most people, published both in this country and around the worldùmostly over the last twenty years. Provide an alternative treatment and recovery program for people who have depression and a history of childhood and other traumas. Mental illness is common. It may affect up to 40 percent of the United States population during their lifetime. Since about 1960 psychiatry has gradually been building a biological base for the mental illness that it treats. While some have criticized it, its evolving American Psychiatric Association Diagnostic and Statistical Manual (DSM) has helped clarify a number of ways that psychiatrists and other clinicians have come to view some of the more painful aspects of the human condition. During this time, countless articles and books were published to support their growing idea that most mental illness is due to a genetically transmitted brain problem. With the help of the drug industry, this theory spread throughout medicine and the helping professions, and eventually into the public belief system. In 1974, the United States Congress passed the Child Abuse Prevention and Treatment Act, which supported the child abuse prevention and treatment movement. Although there had been sporadic papers and reports describing the effects of childhood trauma since 1896 (e.g., written by Freud, Janet, Brauer, Ferenzci and Horney), clinical and basic researchers began to report their findings on these effects, especially from the mid-1980s. It may be timely now to promote the role of the helping professions in the treatment of traumatized children and adults, as well as the personal power of trauma survivors to help themselves heal. This is because the documented evidence in the clinical scientific literature has increased since 1980 to show a strong link between trauma and depression and other mental disorders. In this book and the next, I describe this evidence for each of the most common illnesses. The most studied and commonly reported disorder linked with a history of childhood trauma is depression, which I cover in this book. I also present principles of trauma, its effects, and its treatment and recovery. In the second volume I then review the next most reported and trauma-linked disorders. These are: addictions, including alcohol and other drug problems, eating disorders, nicotine dependence, post-traumatic stress disorder, anxiety disorders, dissociative disorders, personality disorders, psychosis, behavior problems and violence. These two volumes will interact and support one another periodically in their text. The data found in the nearly 300 scientific reports that I summarize and cite raises potentially important questions and concerns for all child, adolescent and adult victims of trauma and the clinicians who assist them. How can we improve our awareness of and our approach to people who have experienced childhood and later trauma? Given this new knowledge, how can mental health services best be improved? And how can survivors of trauma recognize its effects on themselves and then find effective recovery aids, including knowledgeable and experienced health professionals? While assistance from clinicians may provide an important way for trauma survivors to help identify the causal factors for their pain and help them discover how best to handle it, it is ultimately up to affected individuals to become aware of the link between their pain and numbness and their past trauma. In my research over the years I am sure that I have missed some important articles, chapters and books that support the numerous findings that I cite here in this book. I hope that the authors of studies I may have missed will tell me of their work so that I can add it to this already massive collection of important but overlooked data proving my observations. I also ask that the reader bear with me when the reading may be dry. By translating this wealth of otherwise dense and complex information into a more reader friendly and useful format, this may be the first time that anyone has gathered and explained the truth about depression and other mental illness and our choices to heal from them. We can step out of the box of our conservative and sometimes limited beliefs about the nature and cause of mental illness. I ask the reader to consider opening your mind to the possibility that trauma from childhood could be contributing to or even causing some mental illness. And perhaps with this new information you will understand an important alternative to healing it. Armed with this understanding, people with depression and other so-called mental illnesses can now consider more possibilities and choices as they heal. At the same time, some of their family may now be able to support these alternative forms of healing. This book offers state-of-the-art information that I hope will allow affected people and their families, their clinicians and other important people in their lives, to expand their understanding of the mystery of depression and other mental illness. ¬2003. All rights reserved. 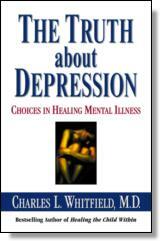 Reprinted from The Truth About Depression by Charles L. Whitfield, M.D. No part of this publication may be reproduced, stored in a retrieval system or transmitted in any form or by any means, without the written permission of the publisher. Publisher: Health Communications, Inc., 3201 SW 15th Street, Deerfield Beach, FL 33442.